A hovercraft, an aa kent as an air-cushion vehicle or ACV, is a craft capable o travellin ower laund, watter, mud, ice, an ither surfaces. 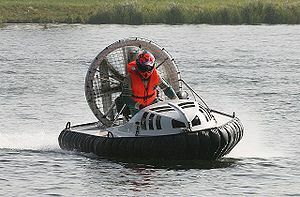 Hovercraft are hybrid vessels operatit bi a pilot as an aircraft rather nor a caiptain as a marine vessel. This page wis last eeditit on 27 Mairch 2017, at 00:33.